Teenage Wonderland Exclusive Q&A With Lizzy Small! Lizzy Small is an actress who will be seen in the upcoming feature film Spare Parts, set to open nationwide in January. No stranger to entertainment, she has starred in countless television commercials and she was a series regular on the series Hip Hop Harry. Other notable roles include The Santa Clause 3: The Escape Clause and a guest role on The Middle. The video to her single, Gravity is available on Youtube. We were so excited to have an exclusive Q&A with this young rising star! TW: You have a song and music video out on Youtube called Gravity. What inspired you to write this song? LS: Gravity is about having that connection with one person that no matter where you are or what you’re doing, you are drawn to them. I wrote gravity during my senior year of high school which was a time of reflection. This reflection led me to realize certain aspects of the beauty of life I hadn’t always been consciously aware of. TW: Do you have formal vocal training? LS: Yes, I have been training with a vocal coach since for many years. TW: You have a dance background. Can you tell us about your dance background? LS: I have been dancing since I was about two years old. I’ve trained in all styles including ballet, jazz, tap, hip-hop, modern, lyrical, contemporary, salsa and more. I competed in a dance company for several years and in 2012 my studio ended up winning first world championship at Nationals in Las Vegas. I loved my days of competitive dance they will never be forgotten and neither will all the rhinestones. TW: You started acting at a young age and have starred in countless commercials. What were some of your favorite commercials and why? LS: One of my favorite commercials that I did was my Dairy Queen Campaign. I remember filming one day where we ended up running through a drive-through carwash fully clothed and it was pouring rain outside. We definitely had some crazy and fun times on set and the entire family that I was cast with was a blast to work with. We did lots of improv which was unusual because it was a commercial campaign so it was super exciting and kept me on my toes. TW: You are starring opposite George Lopez, Marisa Tomei and Jamie Lee Curtis in the upcoming film Spare Parts. Can you tell us a little bit about the movie and about your role? LS: Spare Parts is based on a true story which is what I find so unique about the film. It centers around four high school boys who have a dream to compete in a robotics competition where they end up winning against MIT. I play a student from Cornell who competes against them in the competition and I also am the love interest of one of the four main boys. TW: What was it like working with such famous actors? Did you get to work with any of them in your scenes? LS: What I find most exciting about working with big actors is being able to watch and observe the way they prepare for a scene because I learn so much. I had a few scenes with George Lopez who was more than friendly, welcoming, and gave me great personal advice. Everyone was truly so easy to work with, so kind and had such a great sense of humor. TW: You are now a freshman at the University of California at Santa Barbara. Is is difficult balancing a professional career in Hollywood while in school? LS: Balancing my professional career and academic life has always been a challenge but it is something so important and worthwhile to me. I actually just finished my first week of finals as a college freshman. I’ve definitely had to learn how to prioritize/ strategize my time and make the most of every second! TW: If you could work with five actors (male or female) who would they be? TW: What would your ultimate dream role be? LS: I have so many dream roles because my ideas keep expanding every day. But I would definitely love to play a lead role in a dramatic film about constructing my identity through past memories. A comedic series like Modern Family would also be inanely fun and amazing! TW: Can you tell us what 3 things you keep in your purse and never leave home without? LS: Burts Bees Pomegranate Chapstick, a highlighter and hand sanitizer. TW: What can we expect next from Lizzy Small? LS: Right now I am really focusing on my music and building up a team to hopefully start performing live shows. I’m in the process of writing new songs once I release the rest of my Gravity EP. I am also promoting “Spare Parts” which comes out in theaters January 16! TW: Where can fans find you on social media? LS: Find all my social media links on ElizabethSmall.com. I love to hear from you guys!!! 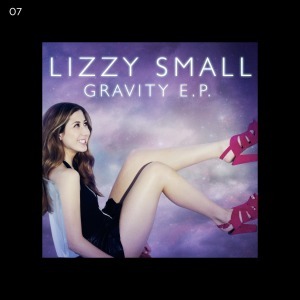 You can watch Lizzy’s video for her single Gravity by clicking here!